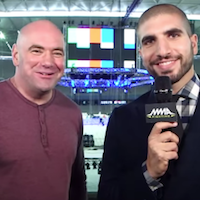 Renowned MMA reporter Ariel Helwani was a guest on The Dan Patrick Show on Audience Monday and gave his side of the story to why he was thrown out of UFC 199 Saturday night and was told he won’t be granted media credentials for future UFC events. So what happened? Helwani broke the news of the Nate Diaz vs. Conor McGregor rematch taking place at UFC 202, as well as the return of Brock Lesnar at UFC 200. The UFC brass didn’t appreciate him upstaging them by releasing the news first, although Helwani was basically just doing his job. Listen in as Helwani explains to Patrick exactly what went down. Helwani goes on to tell Patrick how UFC President Dana White reacted when he was called to the back for the face-to-face meeting that sent him packing. The Dan Patrick Show airs on AT&T’s Audience Sports – Channel 239 – Monday–Friday 9:00am – Noon ET.